In early December of 1912, a new upper-class leadership honorary, "The Skull and Bones Society," was organized at the Pennsylvania State University. It was one of six such organizations formed in a six-year period, and it had twelve junior men as its original members. It was organized with the purpose of eliminating false pride, excessive self-esteem, and grand ideas of personal glory, and to honor humble service and unselfish leadership. The era of Penn State University President Edwin E. Sparks from 1908 to 1920 was marked by the rapid growth of extracurricular activities on campus. During this time, many fraternities and clubs were started. Honorary and "HAT" societies were developed during Sparks' term as a way of recognizing leadership on the part of students in both academic and extracurricular activities. 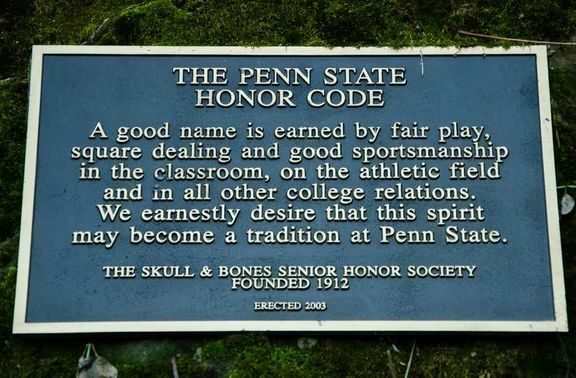 Skull and Bones was organized by twelve juniors to distinguish outstanding senior men on campus and to foster the advancement of academic and athletics interests, the perpetuation of honored traditions, and the maintenance of the general spirit of Penn State. This was accomplished in part by promoting class spirit and "by untiring watchfulness, to forestall and correct any tendency toward a disregard for or violation of college customs and traditions." The 1914 La Vie yearbook marked the first appearance of Skull and Bones as a group with a photo of the twelve founding members. The founding twelve consisted of athletes and editors, and most were Agriculture majors. By the time the 1916 La Vie was published, campus societies -- which had been listed with the local fraternities -- were enough of a presence to warrant a separate section in the yearbook. In the 1920's, honorary members were introduced, the first two being University President John Martin Thomas and head football coach Hugo Bezdek. During the early years of the society, tapping new members was done in a public manner. The annual tapping ceremonies were held on "Move-up Day" at the end of spring semester, when the juniors would be accorded their rank as seniors. In later years, it became common for the introduction of new members to be unpublicized. The 1935 La Vie was the first yearbook to include a brief description of the society and indicate the broader variety of members inducted into Skull and Bones as compared to other societies such as Lion's Paw and Parmi Nous. The description read, "Skull and Bones, another upper-class campus society, selects its members from a wider range. It selects from outstanding juniors and seniors in athletics, publications, and other undergraduate extracurricular activities." Skull and Bones tapped its first African-American member, James H. Redmond, in 1936. Redmond was an Agriculture Economics major from Philadelphia who was captain of the track team and a star on the cross-country team. The Daily Collegian reported in 1944: "In pre-War days, freshmen feared and respected Penn State societies. HAT societies have a job to be done. They should teach the freshmen class that Penn State customs have a serious purpose behind them." The organization has generally preferred to work inconspicuously toward these goals, but at times will never refrain from donning "the hat." The Society was active from its founding until World War II, when many undergraduate men were called into military service and much of Penn State revolved around the War effort. The Society became inactive for 18 months after December of 1942 tapping. On Sunday, August 6, 1944, returning alumni Ridge Riley, Louis Bell, and James Coogan, tapped 10 outstanding men, and the Bone was revived. The society's selection and initiation returned to traditional spring-only tapping starting in 1947. In the 1947-48 academic year, under the leadership of President Lawrence G. Foster, Jr., S&B tried to establish a national governing body for the numerous local Active chapters extant in the United States. The Society sent letters to 30 colleges and universities with the proposed national as a goal. Their efforts were not successful due to the fact that other chapters did not want to conform to national guidelines on who could or would be tapped, how to initiate, and what would be the purpose of each local chapter. Thus today there are several similarly named chapters across the U.S. that are not affiliated. From 1948 to 1958, the campus societies were governed by a board of the society presidents known as the Hat Society Council. The Council established rules and procedures for all the hat societies and helped to establish the societies' role and functions in student life, particularly in governing freshman customs and honors functions. It went defunct in 1959 and was revived again in 1960 for one year. In November, 1953 the Society voted to limit its membership to 25 total, in order "to maintain the prestige of the group by making its membership more select" and to eliminate the sentiment that undeserving individuals were being offered membership in the hopes to fill out the membership total for that year. The membership limit has fluctuated through the decades of S&B's existence. In the years prior to WWII, the Society initiated 10 to 29 members. Since 1974, the membership limit has remained as one member for each 1,000 undergraduates at University Park. Through the 50's and 60's Skull and Bones members acted as ushers at official College functions such as Honors Day in the spring and the inaugural reception for President Milton S. Eisenhower, who became an honorary member in November of 1952. S&B at this time cooperated with the Student Tribunal in instructing new students on College customs, traditions and history. S&B was very instrumental in beginning the Orientation Week activities that were first started in the fall of 1953, through members' serving as Orientation counselors, forerunners of today's orientation leaders. It was also tradition during this period for Skull and Bones to form an honor line with other HAT societies on the football field during home games. In past years, the Society sponsored pep rallies and other spirit-raising events for the team. The Society began doing so again with the 1991 Notre Dame-Penn St. game and most recently the 1992 Miami game. Following S&B's loyal support through the years, on March 31, 1950, the Society mailed out letters to 60 alumni clubs exhorting them to lend their support to the effort for a "Big time College Coach for a Big Time College," when Bob Higgins retired. We organized student rallies to testify to the fact that the team was moving to another level and needed the high-quality coach to match. Partly through these efforts Charles "Rip" Engle was hired and he brought with him his "scrawny" quarterback from Brown, Joe Paterno. The rest is history. Rip, as he was affectionately known, was made an honorary member in the fall of 1954. In the 1960's it was normal for honorary members to be called out of the stands at half-time of home football games and inducted then. Honorary membership was given only to University faculty, staff, and administrators until 1967, when Pennsylvania Governor Raymond Shafer was presented for membership by University President Eric Walker, being called out of the stands to accept his "hat". In 1968 PA Senator Richard O. Schweiker, an alum, was given the same presentation. The 1970's saw a more laid back attitude among students and traditional student organizations lost the interest of many, with greek organizations particularly suffering. The three upper-class societies -- Skull and Bones, Lion's Paw, and Parmi Nous -- continued on while the exclusively women's and underclass hat societies disappeared. In 1974, Skull and Bones inducted women for the first time, with Doreen Sue Davis and Pamela Ann Huston being the first. One of the last appearances of Skull and Bones in La Vie was in 1980, as the society continued to diversify by race, gender and sexual orientation. The special category of Associate was created to honor a graduate student in each tap class, and the Honorary list grew with University Presidents Bryce Jordan and Graham Spanier. In 2003 the Skull and Bones Society at Penn State unveiled the "Honor Rock," an engraved plaque mounted on a rock outcropping along a walkway near Old Main. The Skull and Bones Society at Penn State has always been a step ahead of society at large in the members it initiates. From the first African American initiate in 1936, to the first women in 1974, these firsts challenge any notion that Skull and Bones at Penn State be likened to an old boy's network laden with backward traditions. The first African American officer of the Society was Ronald Ross Davenport in the 1957-58 academic year as Guardian of the Skull (Vice-President), and the first woman to be President of the Society was Mary R. Musca in 1977-78. Today, membership in the Skull and Bones Society is highly regarded and stands as the one of the highest honors that junior or senior women and men can achieve at Penn State University.